I don’t know what to write on Tommy D.’s valentine. How about: You have a distinct odor. No, you can’t. So, what’s he good at? Running? Playing on the monkey bars? Maybe you should skip him? Go back after you’ve had time to think about it. Two days later, he struts into the kitchen, crowing because he’s managed to find something about which to compliment Tommy D.
Tommy D. is really good at being first in line. Your complimenting him on his ability to cut in front of people? We ask his brother what he wrote on Tommy D.’s valentine. Oh, that was hard. It took me a long time, like 5 minutes. That he’s fun to play tag with. Because I can run faster and I don’t smell him when I’m running away from him. 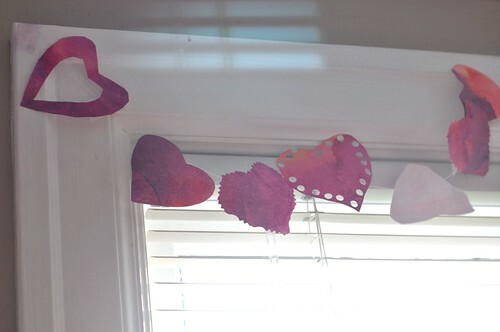 * Where credit’s due: Hearts on string is a riff on GardenMama’s valentine garland tutorial. Denise, their struggle over valentines was just too good. I had to share.